I'm late in typing this week's entries by Charles Leonard "Lennie " Davis in his pocket diary for the Year 1898. But here I am. And here is Lennie, of Wakefield, Nebraska.....his words are in black bold. Our Captain Dewey captured a Spanish fleet in the ?? Sea at the Philippines. Started to take the cow to pasture. 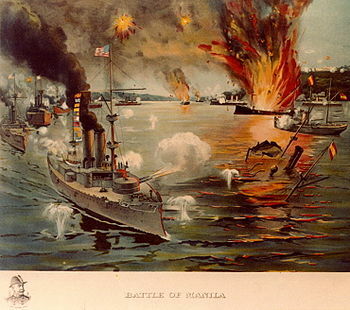 From May 1 to 3, 1898, Commodore George Dewey of the United States Navy fought the Spanish fleet, manned by Spanish and Filipino sailors, stationed at Cavite Puerto at Canacao Bay. The battle was of great significance to Philippine history because it marked the end of Spanish sovereignty and the beginning of the American regime. In world historical perspective, the battle siggnalled the entry of the United States in the community of world powers. You can read more by clicking here. Tuesday, May 3, 1898 Lennie makes no entry in his diary this date. Jessie Dorf ? went out to pick flowers. No school. Art ?? came home. Had an exhibition at school of the ?? work to be sent to Omaha. On this day Theodore Roosevelt is named Lieutenant-Colonel of the Rough Riders who will charge up Kettle Hill and San Juan Hill on July 1. Actually only Roosevelt rode a horse. The rest of the fellas were afoot. You can read more here. Killed 300, ?? 400 ??. Lennie makes it sound as if he, personally, received word from Commodore George Dewey but I'm sure you won't mind if I say that surely is not the case. Why would Dewey be sending word to a rapscallion 17-year-old boy in Wakefield, Nebraska, who spends half his time walking girls home from church and the other half out riding his bicycle or going to band practice! Nope, I'm certain Dewey was not in direct correspondence with our Lennie. But at least Lennie is keeping up with the news....even if his handwriting is a bit illegible. Meanwhile Omaha Bee reports that the Nebraska National Guard orders all commanders to recruit their respective commands to the maximum allowed by law, vis; eighty-one enlisted men. All recruits are directed to appear at Camp Alvin Saunders until May 2, 1898, after which they will report at the rendevouz at Old Fort Omaha near Omaha, Nebraska. The paper is full of news on the war with nation after nation weighing in on how they view the situation.